Two of the main challenges facing Anglican churches in the 21 st Century UK are changing patterns of use and, in parallel, the swift advance of technology making visitor expectations far exceed those of previous generations. At Hull Minster, a multi-million pound transformation project is addressing these and many more issues. Working with SFL Group and Yamaha audio equipment, a significant part of the project has been a major upgrade of the Minster’s AV system. The medieval Minster has been a place of worship for as long as the settlement of Kingston upon Hull itself. Named Holy Trinity Church until May 2017, the Grade I listed parish church is the largest in the UK by floor area and became Hull Minster during the tenure as UK City of Culture. From its inception by King Edward I, the church was intended to be as much a community centre as a house of worship. However, in the early 2000s Hull had the lowest church attendance in the United Kingdom, so the Minster’s leadership has long been aware of making it more inclusive and attractive to a wider demographic. Dubbed the Amazing Transformation, a major investment is aiming to turn it into a high quality performance and arts venue, as well as radically updating its facilities for worship and pastoral care, forming a centrepiece of the city’s Old Town. Completed in December 2016, the first phase was to re-order the churchyard, removing the surrounding wall to welcome people in (rather than presenting a physical and psychological barrier) and creating a large outdoor space for community and church events. The next phase included moving the fixed pews to the side of the nave, which would make a large, flexible space reminiscent of the medieval church. Importantly, this would be suitable for concerts, performances and banquets, as well as worship. Alongside this - and new underfloor heating, improved accessibility and a new visitor centre/shop - a major upgrade of the AV facilities has ensured that, whatever the event or occasion, Minster visitors will enjoy a truly 21 st century experience. Installing the new underfloor heating meant replacing the entire floor of the nave. This gave SFL Group the opportunity to route a new Dante audio network beneath it. Covering the full length of the Nave and the chancel, the Dante network forms the backbone of a Yamaha audio system comprising a Yamaha TF3 digital mixer, a pair of TIO1608-D stage boxes and an MTX5-D matrix processor. The system is controlled by Yamaha’s Wireless DCP app and an MCP1 surface-mounted controller. The MTX5-D takes feeds from the Dante network, as well as wired and wireless microphones, managing these and the outputs to the loudspeaker system via a number of presets. As the system has a lot of possibilities, Andy and the SFL team programmed the presets to be modular, allowing Minster staff to build a full setup by making a series of smaller decisions, for example which audio sources and zones are active. “We needed the system to be easy to use by engineers of all skill levels, have a reputable and reliable product and, most of all, have integrated Dante networking that could communicate simply with other devices. 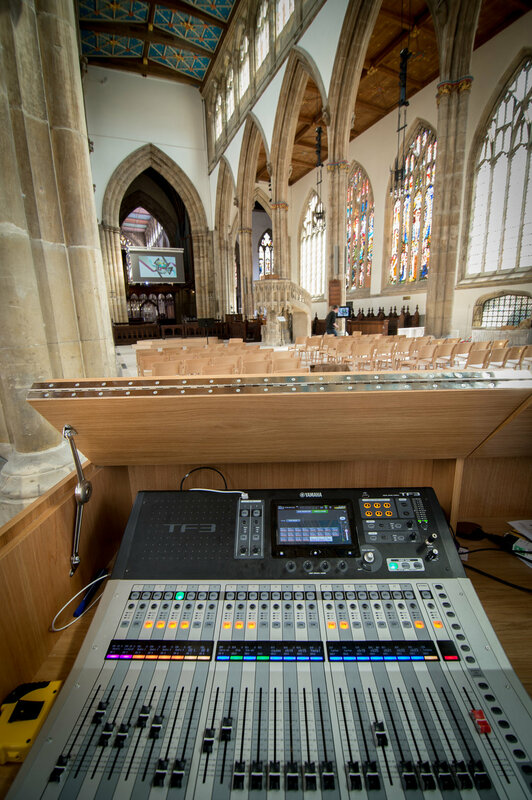 We’re extremely pleased that the Minster team found the TF3 so easy to use and that it and the I/O units integrate so seamlessly with MTX5-D,” says Andy. This phase of the Amazing Transformation was completed by early 2018 and, although there are further improvements to make, those completed so far have already made a significant difference. James Symonds, events co-ordinator at the church commented, “Hull Minster is fast becoming renowned as a place for great events and concerts both from it’s setting, within 700 years of history, but also with the ability to achieve almost all types of musical styles through the in-house system. This negates the need to bring in external PA companies to provide even the simplest of sound reinforcement systems.